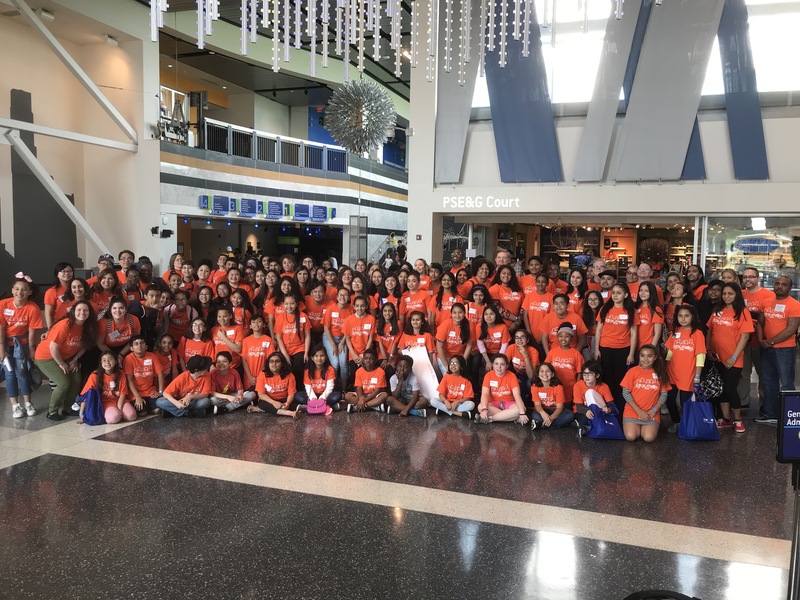 Jersey City, NJ– On Saturday June 2, the Liberty STEM Alliance hosted its first annual Hudson County Hack-a-thon for 5th – 7th grade students at Liberty Science Center. Over the course of 7 hours, the one-day mobile app creation competition, nicknamed “Hack Hudson,” challenged 120 students from Jersey City Public Schools and Union City Public Schools to use coding and technology to identify and solve a current problem facing Hudson County. Along with providing a platform for students to compete, expand learning in STEM (Science, Technology, Engineering and Mathematics), and develop skills in computer science, computing and information technology, and engineering, the Hack-a-thon allowed Hudson County students to push the envelope in creative thinking, problem solving, and hands-on learning. “We are thrilled to work with local students to help them develop their STEM skills and to apply them in creative ways to improve their communities,” said Christine Arnold-Schroeder, Vice President of External Affairs at Liberty Science Center, and member of the Liberty STEM Alliance Steering Committee. Before splitting into teams, the students were first treated to a keynote presentation by Eduardo McLean, a Google senior software engineer who shared the importance of technology throughout the progression of his career. “You are all young and you have the amazing gift of time. Take today as an opportunity to refine your skills early and get a head start on being great,” McLean advised to the students. Over 60 parents of participants also had the opportunity to acquire new skills at Saturday’s event, with the Hack-a- thon featuring a parent education program. The full-day workshop allowed parents to learn the basics of design learning, coding and how to prepare for college and financial aid. Simultaneous translations were available for both Spanish and Arabic-speaking families. “With the demand for STEM skills growing at such a rapid pace, we felt it was just as important to educate our participants’ parents on these topics, as it was to educate the students themselves,” said Jazlyn Carvajal, co-founder of Latinas in STEM and Chair of the Liberty STEM Alliance Hack-a-thon Planning Committee. The Hudson County Hack-a-thon was hosted by the Liberty STEM Alliance (Alliance), a renowned community dedicated to enriching STEM opportunities in Hudson County by incorporating all voices, creating pathways, and serving as an information hub. The Alliance has developed through the strong, existing relations among Hudson County stakeholders (such as Liberty Science Center, Jersey City Public Schools, Union City Public Schools and New Jersey City University) in the advancement of STEM learning. Support for Hack Hudson was generously provided to the Liberty STEM Alliance by the New Jersey STEM Pathways Network via the Overdeck Family Foundation, Latinas in STEM, Jersey City Public Schools, the Union City Board of Education, and Horizon Blue Cross Blue Shield of New Jersey. You can learn more about Hack Hudson by visiting www.hackhudson.com.